Start to attract abundance into your life with some spring cleaning! We are energy. So in every moment that we are living we are experiencing a flow of energy. We want the energy to flow to us in an abundant, flowing, joyful, and peaceful way. We want it to flow that way, but sometimes it seems like it is doing quite the opposite and we feel blocked, tired, and wondering if the universe is really listening to us. Other times and perhaps most often we live in a bit of a grey area. We forget that we are the creators of our realities. We get stuck in the routine and live our lives on autopilot. In this space, our energy is flowing, but it is flowing to us in the manner in which we are. We attract what we are. Energy is attracted to us by in the state of being we are living in. If we are constantly on autopilot, we will keep the flow of being in the cycle of the same mundane lifestyle. Our thoughts create our reality. Every thought we have has an energetic pattern and attraction to it. Every choice we make, every intention we have, and every action we take has an energy to it and will produce an energetic outcome. There are so many ways to help to get into the flow of abundance. Many of which I teach in my manifesting miracles course. However, one great sure and fast method to manifest abundance into your life is decluttering. Decluttering our homes has become quite popular in today’s modern culture. Indeed, it is actually an amaZING and fast way to attract more abundance into your life. Decluttering essentially means getting rid of things in your life that no longer serve you. Do you want to begin attracting the energy of abundance into your life and really have it flow to you? 1. 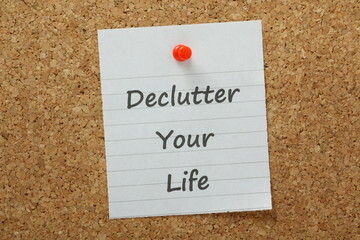 Declutter Your Surroundings – Have you ever done spring cleaning and afterwards felt that sense of relief? The relief of letting go of so many things that you no longer need. When you declutter your space, you create more space to allow miracles to enter into your life. Wherever you do your soul work, whether it be your home office or your living room, should be a place where you go into and feel immediate peace. Start by removing the unnecessary clutter and organizing your personal space. Do you have old clothes that you haven’t worn in years or perhaps have never worn? It’s time to give yourself permission and let go of them. Let go of the things that you don’t need. You can give your clothes away to people in need and help create more abundance in other people’s lives. Releasing things can start to clear out the old stories that no longer serve you. With an uncluttered space, you can think clearly and allow for more abundance into your life. 3. Declutter Your Relationships – Perhaps you are already aware of current friends or people who drain the energy right out of you. The people who think that you are a little too “woo woo,” the people who do not fully support you, or the people who like to put a little dig or jab in and make you question yourself. You do not need these type of people in your life. By keeping negative and toxic relationships in your life you are showing the universe how much you value yourself. You want to show the universe that you love and honor yourself. By surrounding yourself with the right kind of people – the people who are more energetically aligned to you – you will begin to see shifts in your life. 4. Declutter Your Health – Just like you want healthy and positive relationships with other people, you also need a healthy relationship with yourself. I recommend simply increasing your daily water intake. I drink 2-3 liters of water every day and have seen enormous improvements in my energy levels. Stop eating food that is bad for you (hint: you know they are bad because your body feels bad after eating them). Exercise more. Try to get at least 30 minutes of cardio daily in your life. If you have a current job that is more sedentary, get up and walk around your office or walk after work. You will feel better. And manifesting is all about how we feel. When we feel good we can begin to manifest miracles. All of these decluttering tips are about creating more space in different areas of your life to help you feel better. When we clear up space and feel good, we can begin the process of manifestation and attract miracles into our lives. Miraculously and amaZINGly, everything I need always comes. The universe is opening me to receive beyond anything I imagine. Jaclyn Marie is known for her ability to connect with you deeply, allowing space for graceful expansion, self discovery, powerful healing and radical transformation. Her life’s mission is to help others find their true soul’s purpose and uncover the wounds, discover their limiting beliefs and transform and transcend them and begin their journey on living their authentic truth. Jackie is a master manifestor who teachers the methods of co-creating and living a life beyond your wildest dreams. She feels it is her duty and purpose to empower others and discover their authentic selves so that they too can live a life that is wildly successful and wake up every day feeling enthralled.